Back in January 2018, we were very excited when our long-standing customer CAE purchased 45% shares to acquire part of our company Pelesys. Over 20 years we have grown into a global leader in web-based aviation training solutions for customers from airlines like United and Delta, to training providers and OEM’s. We have one of the largest, independent courseware libraries in the aviation training industry covering aircraft specific courses (Boeing 787/Airbus A320 Neo) to special operations courses (Cold Weather Operations/Fatigue Risk Management) to our entire library of aircraft maintenance training products. By teaming up with CAE we can now provide our industry-leading customer service and aviation training solutions for both civil aviation and aircraft maintenance training to more customers around the world. But you might be wondering how and why did Pelesys begin? To understand the history of Pelesys we sat down with the president and founder George Wang. What was your occupation before Pelesys? I worked for Canadian Airlines before it became part of Air Canada, looking after Canadian’s computer based training facility. At that time, training was provided by proprietary solutions from WICAT and TRO. We were one of the first to deliver training solutions based on non-proprietary, industry-standard platform. Why did you start the company? Tell us a little bit about how it came to be. Internet was still in its infancy and was certainly not suitable for multimedia heavy applications. However, we saw an opportunity to apply industry standard tools through a new platform which enabled us to create and deliver better quality training more cost-effectively. We started off by creating interactive training materials with off-the-shelf tools. This cut the cost of development significantly and made it easier for ongoing content maintenance and updates. The initial goal was quite simple: better training at a lower price. Eventually, the internet became more robust and bandwidth was more widely available. We evolved by developing our own learning and training management suite of products for internet-based aviation training management and deployment. Along the way, we have expanded our library of training courseware to cover most commercial aircraft. What about Pelesys are you most proud of? I am most proud of our people. We have a dedicated team of professionals and have developed a customer-centric culture over the years. This has helped us expand our services to over 100 customers around the world including Air Transat and Philippine Airlines. We would not be where we are today without our people. Please tell us about the partnership with CAE. What will this do for Pelesys? 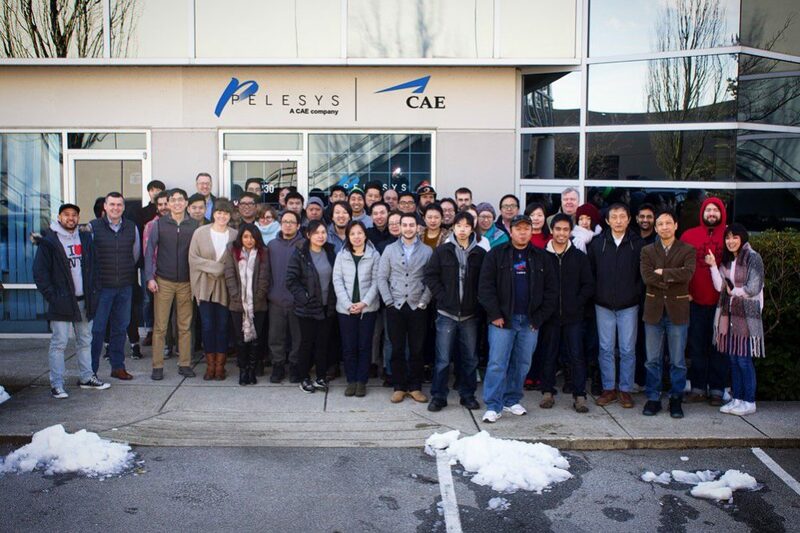 CAE has been a long-term customer of Pelesys. We have worked very well together over the years and we complement each other. There is a great synergy between the companies. By joining forces with CAE this enables us, Pelesys, to expand more rapidly and further enhance our industry leadership position. Tell us about yourself George. I love the aviation industry and have a passion for technologies. I enjoy getting in front of customers and being able to help them achieve their training and operational goals, something I was heavily involved with when we had a small team in the early years. I was kind of the jack of all trades back then. I am an entrepreneur by heart and believe that any giant plan always starts with a small step. If you listen to your customers and deliver what the market needs, everything else will be taken care of by itself. You can find more information on our services including Systems, Courseware or Maintenance Training solutions by exploring our website. If you have any questions or would like to get in touch to learn more about our aviation training solutions or maintenance training please get a hold of us here. Don’t forget to follow us on Facebook, Twitter or connect via LinkedIn for the latest news from Pelesys.